Good nutrition and academic success go hand in hand! 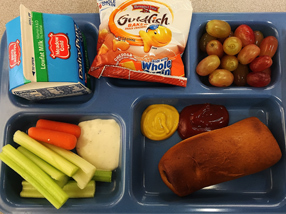 Our School Nutrition Department consists of a team of food and nutrition professionals who are dedicated to the health, well-being, and learning ability of our students. We support academic success by providing healthy meal choices while promoting lifelong nutrition and fitness practices. We are a small but mighty staff of caring individuals who love our jobs and consider it a great privilege to serve your children the ultimate value meal that is both kid friendly and nutritious. We're always looking for ways to improve the quality and types of meals we serve, and we appreciate the relationships with have with you and our students! Please let us know if there’s something you'd like to see on the menu. Yes, we have very strict nutritional standards, but we’re always on the lookout for new items to add to the menu. If you have suggestions, please send them our way. We make many of our menu items from scratch. We have a central kitchen facility where we have recently put a greater focus on scratch cooking. Whenever we can, we prefer to use local ingredients and local companies. The average restaurant typically provides three to five unique food items for children. We're pleased to offer more than 20 menu items and are excited to find new items that resonate with students’ taste preferences. Special Diet? No problem. Just fill out the Special Diet form; we’re happy to work with you to develop a nutrition plan that accommodates your child.